A solid monitor controller with transparent signal path and flexible connectivity at a realistic price. Can control up to three sets of active stereo speakers and a mono subwoofer. Will accept and mix up to four stereo inputs. Two high-quality headphone amplifiers with independent volume controls. Drawmer doesn't mess around when it comes to build quality and, with 30 years of consistency, it is becoming something of a British institution. The company has built pretty much everything over the years but is probably most famous for its compressors, EQs and noise gates. So a move into the 'prosumer' market with a monitor controller is an interesting one. On unboxing the MC2.1, the first thing that hits you is the weight. The entire case is clad in metal top to bottom and this gives it a seriously solid feel. The addition of some sturdy rubber feet means that once you position it on your desktop it's not going anywhere! This is a real plus as more complex set-ups will require the 2.1 to have a good number of thick XLR cables attached to its rear panel. "There is an incredibly smooth, oversized level control - an important part of any monitor controller!" The overall unit is attractive but certainly follows Drawmer's no-nonsense approach. There are no flashy colours or translucent plastics here; the order of the day is black, white and some well placed sensible graphics. Everything is intuitive and functional, making the MC2.1 one of those products you want to plug in and use immediately, with pretty much no need for a manual. The front panel has a good selection of metal push buttons for source and speaker connections, plus coloured LEDs to show you when something is active. There is a dedicated section for the front-mounted talkback mic which includes a smaller level control and toggle switch for speaking to artists. You'll also find two headphone outputs with an independent level control for each. Finally, there is an incredibly smooth, oversized level control, which is obviously an important part of any monitor controller! Although the front of the MC2.1 does have a reasonably slim front panel, it is a pretty deep unit overall. Considering the MC2.1 contains its own power supply and lots of electronics, this is as expected. 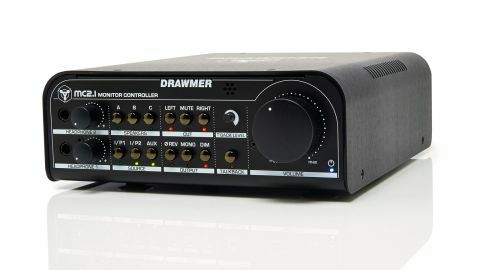 If space is an issue, Drawmer does supply a rather nice rack mount kit for the unit, allowing you to fit it neatly into a two-unit/19-inch space. Design and build quality are important but as the MC2.1 is a monitor controller the most critical aspects to consider have to be connectivity and sound quality. Let's address the former first. "So how does all this analogue goodness sound? In one word - great"
The back panel houses three sets of stereo balanced (XLR) connections for speakers, and the first is augmented by an additional mono XLR connection intended for a subwoofer. There is also a talkback output in this section which takes a direct feed from the talkback microphone on the front panel. The input section is just as flexible with a total of four inputs. There are two female XLR, another two XLR 'combi' (allowing a 1/4-inch jack to be used), a pair of phono inputs and a stereo 3.5mm jack, ideal for mobile phones, tablets and laptops. We have been told that all of these sources can be used simultaneously and will be mixed if activated at the same time. So how does all this analogue goodness sound? In one word - great. Even though this is an active design, the results are clean and transparent and added no apparent colouration to our signal chain. The results that we achieved in testing equalled products in much higher price brackets. To sum up, if you are in the market for a monitor controller or for a way to mix various sources, then you should certainly put the MC2.1 on your list - perhaps even at the top of it.